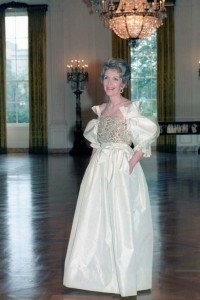 In September 2016, a graduate student from Italy came to the National First Ladies’ Library to conduct in-depth research on the fashions of the last half-century of First Ladies and to determine ways in which the visual impact and their clothing choices had either a political or public impact, as well as to understand their own responsiveness to current trends, and work with American designers in crafting their public image. The NFLL Historian responded both in a lengthy telephone interview and then with written answers to follow-up questions posed to him by the research student. The responses have been reconfigured and adapted into separate entries of individual First Ladies. This five-part series is adapted from that material. Part I covers Jacqueline Kennedy and Lady Bird Johnson; Part II, Pat Nixon and Betty Ford; Part III, Rosalynn Carter and Nancy Reagan; Part IV, Barbara Bush and Hillary Clinton; Part V, Laura Bush and Michelle Obama. 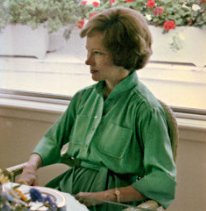 Rosalynn Carter during a state dinner for the Shah of Iran. 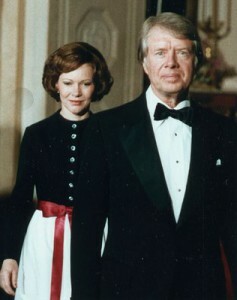 Due to financial constraints and her conservative, religious and rural background, Rosalynn Carter showed little inclination for clothing that diverged too dramatically from the high-neck and long-sleeved day and evening wear that marked her initial White House wardrobe. As the presidency evolved, so too did her tastes, often blossoming with dramatic formal evening gowns marked by satin sashes and bows, while still essentially conservative. She seemed to favor gowns that consisted of separate dresses and blouses. A number of these also reflected the “gypsy” style that was an amalgam of folk costumes in looser patterns. Mrs. Carter’s were a more conservative version of this look that was popular in the late 1970s. 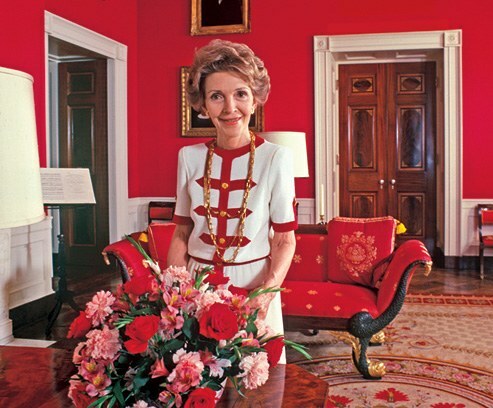 There was a brief attempt by the fashion industry to popularize “Rosalynn Green” when Mrs. Carter first entered the White House, perhaps an homage intended to associate her with the unusual green-white color branding of the 1976 Carter campaign. Mrs. Carter in her trademark green. The colors aqua and green did apparently predominate her clothing choices. 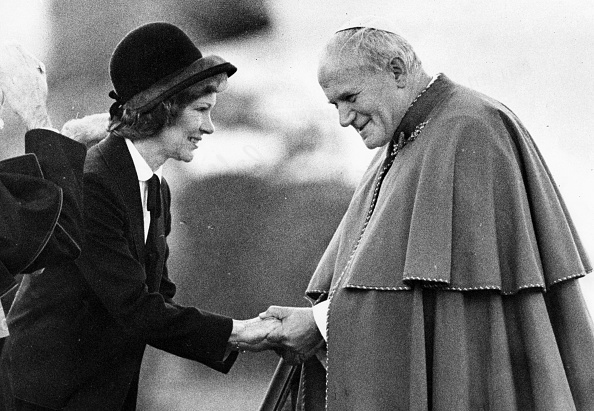 If there is no one image of Mrs. Carter that might be considered iconic it is that of her greeting Pope John Paul. That day, Mrs. Carter appeared at National Airport to welcome him to Washington, wearing in a woman’s business suit of a conservative skirt and matching jacket with a white shirt and small string tie. She also appeared in a hat, a rare accessory for her but one worn in respect for the religious leader. As the first First Lady to make her own office in the East Wing with her staff, Rosalynn Carter treated the First Lady role from the perspective of a professional woman, with specific legislative goals. A number of her most photographed outfits were slight variations on this white shirt-dress suit-woman’s tie uniform. Based on her experiences as an actress in Hollywood, personal appearance was of utmost importance to Nancy Reagan as First Lady. She carefully chose the look she wore and was consistent in conveying a formal, lavish style intended to draw attention. Her evening gowns were invariably in the colors red, white or black. Many of them were sleeveless or shoulderless. Still, her clothing remained within the confines of a feminized, traditional look. She gave the appearance of a highly-groomed woman in her trademark Adolfo suits, with small, square shoulders and ornate piping often in contrasting red and white, and chunky gold necklace. By giving emphasis to fashion as First Lady, however, Nancy Reagan was depicted as being pre-occupied with her vanity at the cost of giving attention to those enduring the recession of the early 1980s. 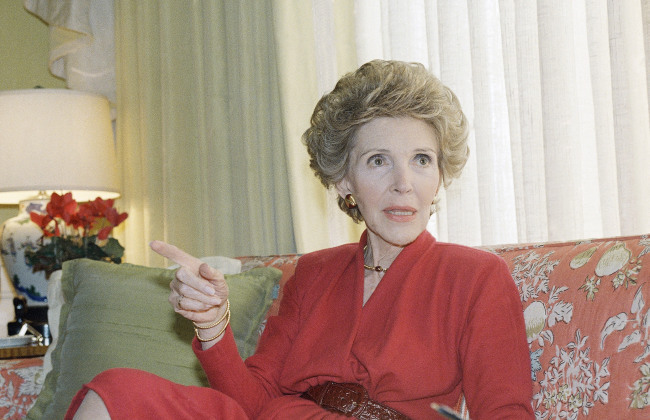 Ignoring the political critics, she soon enough became a rare instance of a First Lady whose fashion style developed into a political liability for the President. Only on one occasion was Nancy Reagan critiqued poorly for the style of clothing she wore, in that case for donning a pair of black knickers beneath a black dress for a formal dinner with the French president in Paris. 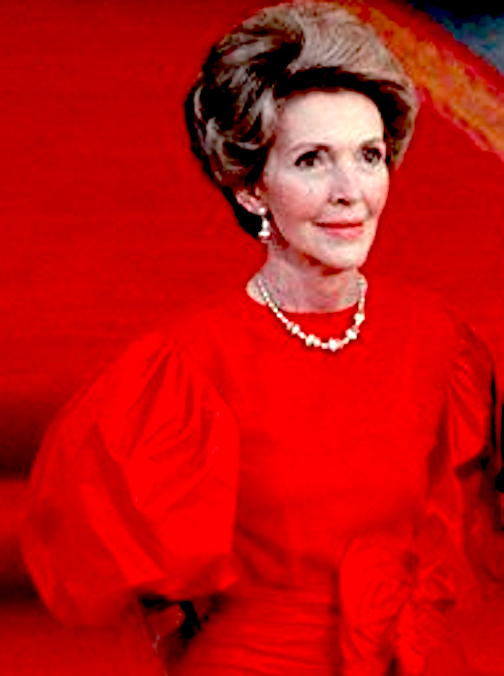 Generally, however, Mrs. Reagan was highly praised by fashion industry leaders who credited her for helping focus public attention on high-end designer clothing for women, even among those who could not themselves afford to purchase it.